Are there limits to how many sessions a student can have at Student Counselling & Development or Accessibility, Well-being and Counselling Centre? Services available through PCS are funded by student ancillary fees. They include personal development workshops as well as group and individual counselling. Our mandate is for short-term counselling – the specific form and length of which is determined on a case by case basis. Although we would very much like to be able to provide ongoing psychotherapy for all students who want/need it over the course of their time at York, the reality is that, due to the high demand for ongoing psychotherapy, we simply do not have the resources to do that. If we were to see some students for a great many sessions, we would not have the time available to provide any sessions to some of the other students who are on our wait list and who also want/need our services. So we do our best to provide, in a timely fashion, at least a intake or crisis session to any student who wants it and to then determine how best to serve each student using the resources that are available to us. How are referrals made from Student Counselling & Development to off-campus resources? When we see students for whom an off-campus referral would be best, we strive to find the most appropriate services available – taking into consideration location, presenting issue, wait times, specific needs/preferences, etc.. As with our other services, this is done on a case-by-case basis. Unfortunately, wait times in the outside community are often much longer that those within PCS - especially for no fee or sliding scale options. We continue to search for additional possibilities and to make links with agencies in the community where possible. Sometimes completing the pre-screening at Student Counselling & Development can be triggering, have they considered an online pre-screening to be completed at home? We have students fill out some paperwork immediately prior to being seen so that the Counsellor can have an idea about the student they will be seeing and also to help the student focus on what they want to tell the Counselor. This allows the Counselor and client to be more efficient and effective in the actual intake session. It also allows students who are initially uncomfortable speaking about their concerns to write these down and know that the Counselor will already know why they are coming in - before they actually meet. We require that this be done while the student is present at PCS rather than at home or at an earlier time than their appointment because some of the questions my indeed trigger a response. If the student is at PCS, they are able to speak with a Counsellor right away after completing the form and can therefore deal directly and immediately with whatever has been triggered. Filling out the form at PCS also means that if the student is feeling suicidal they are able to be attended to right away – rather than being alone in their room or elsewhere. We would love to have a physical set-up whereby students could fill out the paperwork in a private area but our space is limited and, for now anyway, that is not possible in most instances. How are students referred to the psychiatrist at Apple Tree? To the best of our knowledge there is no longer a psychiatrist at Appletree. We wholeheartedly support the idea of Appletree hiring another psychiatrist(s) and we would be happy to work with that person and to refer students to them. We encourage students to make their concerns about the lack of psychiatric services on campus known to the student governments and to any appropriate university representative. How can we work to improve dialogue in the classroom around mental health issues? The Teaching Commons takes mental health issues very seriously and are keen to support faculty and students in this respect. They are in conversation with a number of parties regarding the best way to provide this support. They have a number of workshops and courses for TAs and faculty, and issues of creating a healthy climate in classes is one of the topics they address. They are aware that they could do much more and are working on this. How can we improve education around mental health language on campus? Health Education & Center for Human Rights, Equity & Inclusion are currently working on a project they hope will aid the community on this issue. Is there a way for YFS and YUGSA to program together to break down the divide between undergrad and grad students? This isn't something we've necessarily discussed before. 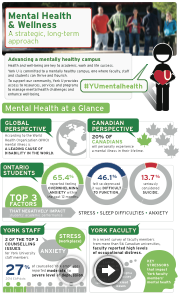 While the YFS represents Undergraduates, our Mental Health Awareness week events and Stress Buster events are typically open to all students on this campus. It's definitely a good suggestion and something we can look into for the future, though!